Sara Ali Khan and her friends have a gala time as they explore Central Park. 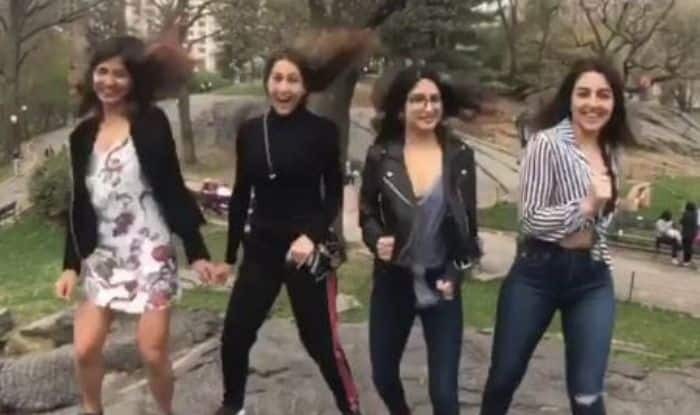 Sara Ali Khan is busking on the success of her last two releases Kedarnath and Simmba and is currently holidaying in New York with her friends. She has flooded her Instagram with pictures and videos from her trip that will make you want to pack your bags and go for a vacation with your besties. Sara shared another boomerang video which is all about friendship goals. Sara Ali Khan has been keeping her fans updated with everything she is doing in the Big Apple. From walking through the streets of New York to trying a hand in boxing, Sara is making the most out of her vacation. Now, the young actor decided to explore Central Park with her friends and share boomerangs. A few days ago, Sara was trying out a few activities in the Big Apple which included cycling and boxing. While shooting for the film in Delhi, Sara and Kartik were spotted on several occasions and their videos and pictures soon went viral. One of their video from the set of their film which took the internet by storm was of the two kissings. Though the video was not clear, netizens claimed it was Sara and Kartik. Kartik, on the other hand, will also be seen in Pati Patni Aur Woh with Bhumi Padnekar and Ananya Panday.